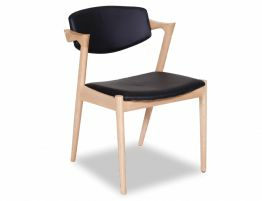 Our ZED Dining Chair - Natural American Ash - Black Pad is a fantastic example of design using solid American Ash and black heavy duty black Upholstered Pad in PU leather. 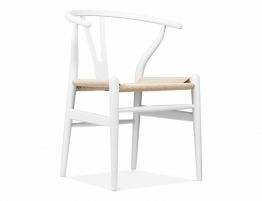 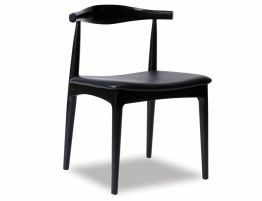 This is a quality copy the original Kai Kristiansen 42 Chair is very popular with fans of modernist furniture design. 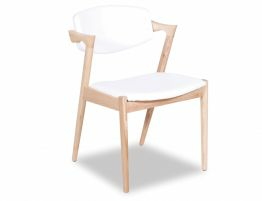 It displays the classic style of Danish wooden designs of the time, with its angular solid timber frame, minimalist form and curved back. 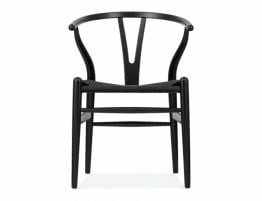 This is a premium product that, like the original, is built to last. 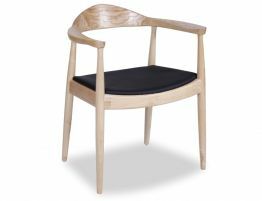 It has a solid timber frame that is available in natural American Ash woods and is upholstered in black vinyl for a leather look.